Good evening Fight Fans, and welcome to our coverage of tonight's edition of WWE NXT! While you're here you can leave a comment below and check out our forums as well as our premium service Fightful Select for exclusive content! 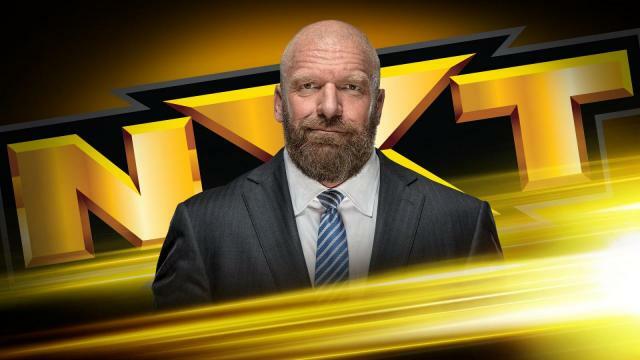 -Triple H comes out to the ring to start the show and talks about Tommaso Ciampa having surgery and having to relinquish his NXT Championship before announcing a fatal five way between Ricochet, Adam Cole, Aleister Black, Velveteen Dream and Matt Riddle with the winner facing Johnny Gargano for the NXT Championship in a Two Out of Three Falls match next month at NXT Takeover: New York. -We get a video package for Tommaso Ciampa preparing for his surgery before we get a video package for all five participants in the number one contender fatal five way later tonight. -We get a vignette for the finals of the Dusty Classic next week between Aleister Black and Ricochet and The Forgotten Sons. Everyone brawls as soon as the match starts until it's just Aleister and Dream in the ring, the two countering each other until Dream gets a two count off of a roll up and Aleister drops him with a boot. Adam pulls Aleister out of the ring and gets sent into the steps before Ricochet sends Dream out of the ring and Matt hits a series of gut wrench suplexes before Adam attacks Matt and stomps on him in the corner. Adam plays to the crowd before he's double teamed by Ricochet and Black and the two shake hands before Adam hits Ricochet from behind and sends him into Aleister who falls out of the ring. Adam hits a neckbreaker and knocks Matt from the apron before hitting a float over suplex for a two count and follows up with a back suplex for another quick two count. Ricochet hits a rolling dropkick before Dream sends him through the ropes and hits Adam with right hands and slaps. Dream knocks Black off of the apron and sends Adam out of the ring before hitting an ax handle off of the top and gets caught by Matt once he's back in the ring with a German suplex. Dream tosses Matt out of the before Black hits a shining wizard and an Asai moonsault for a near fall. Adam drags Aleister out of the ring and sends him into the steps before he squares off in the ring with Matt and exchanges chops until Matt counters a superkick into an ankle lock. Dream breaks up the Bromission and all five men exchange strikes until everyone collapses on the mat before Adam catches Ricochet up top and goes for a superplex before it's turned into a four man superplex to Ricochet. Black hits a roundhouse kick into a German suplex that Matt breaks up before suplexing Aleister for a near fall that Adam breaks up, Adam hitting an ushigaroshi that Ricochet breaks up before he hits an ax kick and Adam superkicks him. Ricochet hits a reverse huricanrrana and a tope to the outside before Matt and Dream counter each other until Matt locks in the Bromission that Adam breaks up by dragging the referee out of the ring. Everyone then hits a move before Ricochet hits a frankensteiner with Dream to the outside and hits Matt with a frog splash in the ring before Adam hits him with the Last Shot for the pin and the win. Winner: Adam Cole defeats Ricochet, Aleister Black, Velveteen Dream and Matt Riddle when he pins Ricochet with the Last Shot to become the new number one contender for the NXT Championship. IMPACT Wrestling on Pop TV Results 7/20 LAX Targets Alberto El Patron, Triple Threat X-Division Match & More!